Fall is a wonderful time in Japan. The summer heat has finally passed and now everyone gets to enjoy a time of near-perfect weather. The numerous national holidays also mean lots of opportunities for outdoor fun. For this reason, Fall always seems to be full of activity. This year has been no exception. In mid-August we arrived back in Japan after two months of home ministry in America. It was a busy time of traveling, visiting churches, seeing family, and re-connecting with friends, and as always, the time was way too short. There are always more people to see and more churches to visit. Even though our time was a little more hectic than we had hoped for, it is always relaxing to be in our home country. Overall, we are thankful for a fun and productive home ministry. Upon our return to SIBC, we were greeted to a very nice surprise: a full church! Church attendance usually dwindles during the summer months, and since SIBC is already pretty small to begin with, we really seem to notice the difference in July and August. However, this summer the attendance did not drop at all! This was partly because of the wonderful job that the church leaders and others in the church did while filling in for us while we were away. But this is also because God seems to be at work in the church. We are beginning to see a renewed sense of community, a willingness to serve and a growing hunger for authentic relationship with Jesus. These are things that we have been praying about for quite some time, and now it seems that the Holy Spirit is producing this fruit in the lives of the people. We are thankful to God for His faithfulness and we are excited to start the Fall with this summer momentum. One of the areas we want to grow in at SIBC is in trying to get more people involved in our weekly Sunday gathering. In 1 Corinthians 14:26, Paul describes the Corinthian's method of doing church. "When you come together, EVERYONE has a hymn, or a word of instruction, a revelation, a tongue or an interpretation. All of these must be done for the strengthening of the church." In other words, no one came to church empty-handed. EVERYONE brought a gift and EVERYONE made a contribution to the worship experience. In this sense, going to church in Corinth was not a spectator activity, rather everyone had a part to play. This is our desire for SIBC. We want people to ask the Lord for a gift that they can give away when they arrive each Sunday. The challenge for the church leaders is to re-think how we can do our worship service to provide more opportunities for people to give their gifts. Of course, it is hard to break old habits of doing church, but we desire to slowly create a new culture at SIBC where EVERYONE is involved in the strengthening of the church and in the building up of the Kingdom of God. Besides the new things the Lord is doing at SIBC, this Fall has also seen new opportunities for doing ministry at Kansai Christian School (KCS). Michael has been asked to serve as school chaplain this year, a role which he is very excited about. His main responsibility is to speak at the monthly all-school chapel time. Every Friday the various grade levels have their own chapel, but the first Friday of the month is a time for the whole school (1st thru 12th grade) to come together for worship and a message. It is a very diverse group of kids (Japanese and non-Japanese, Christian and non-Christian) but Michael is enjoying being able to share with them and point them to deeper relationship with Jesus. Michael has also been meeting with some of the students to form a worship team who will lead singing during the chapel time. More than just a rehearsal time, the purpose of the time is to train the kids in the practical and spiritual aspects of leading worship. There are some really talented kids in the group, and in two short months there has already been great growth in both skill and confidence. So far the worship team consists of 2 guitars, 2 keyboards, drums and a bass-in-training. Michael is really enjoying building relationship with these students and is thrilled to see their desire to worship God. Chris has also taken on more responsibility at KCS. Although she was active in the PTA last year, this year she is even more involved in helping to plan many of the school's annual events. In another unexpected role, Chris has also been asked to fill in as a last minute substitute teacher…twice! She too is happy for these new opportunities to serve the Lord. In August 2007, our son, Luke, gave his life to Jesus. 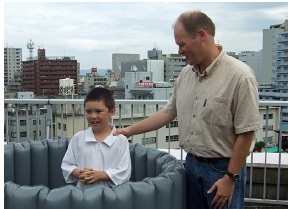 Ever since then he has been asking to get baptized. Well, on October 12th the whole church celebrated with Luke as he took this important step of faith. The ceremony was held in an inflatable tank on the roof of the church building, and was followed by a potluck and celebration time at the church. This was a good day for Luke and a proud day for his parents. We thank God for the wonderful work that He is doing in the life of our son. 1) Please pray that there would be no spectators at SIBC. Pray that each Christian would come to church each week with a desire to give a gift and make a contribution to the growth and health of the church. 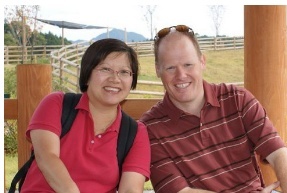 2) Pray for Michael and Chris as they also serve at Kansai Christian School. Pray especially for Michael as he serves as chaplain and gives the message at the all-school chapel. Pray also for the student worship team as they learn how to provide a worship experience where people can encounter Jesus. 3) Pray for Luke's growth as a Christian. May disciplines like prayer, bible reading, worship and Christian service flow from a genuine heart of love for Jesus. Once again, thank you so much for your prayers and support on our behalf. May the Lord bless you for your investment in the work of His Kingdom.